Lost in the celebration over the Nobel Peace Prize to the UN agency eliminating the Syrian government’s chemical weapons is the question of who was really behind the Aug. 21 poison-gas attack near Damascus. Relevant to that mystery is the recent U.S. pressure to control key UN agencies including the prize recipient, reports Robert Parry. Yet, despite evidence that this U.S. manipulation can twist the findings of these UN groups in ways favored by Official Washington, the mainstream American press usually leaves out this context and treats UN findings — or at least those that side with the U.S. government – as independent and beyond reproach, including the OPCW’s recent reporting on the Syrian dispute. 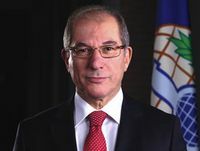 While Uzumcu’s history does not necessarily mean he would pressure his staff to slant the OPCW’s findings against the Syrian government, his objectivity surely could be put in question given his past diplomatic postings and the interests of his home government. Plus, even if Uzumcu were inclined to defy Turkey and its NATO allies – and insist on being evenhanded in his approach toward Syria – he surely would remember what happened to one of his predecessors who got on the wrong side of U.S. geopolitical interests. By contrast, tests for Sarin were more clearly positive from samples taken two and three days later – on Aug. 28-29 – in the eastern suburban area of Zamalka/Ein Tarma. There, Lab One found Sarin in 11 of 17 samples and Lab Two found Sarin in all 17 samples. Though the UN report concludes that Sarin was present in Moadamiyah – despite the failure to identify actual chemical-warfare agents – the report does not explain why the Aug. 26 samples in Moadamiyah would test so negatively when the Aug. 28-29 samples in Zamalka/Ein Tarma would test much more positively. And, Robert Fisk, a veteran reporter for London’s Independent newspaper, found a lack of consensus among UN officials and other international observers in Damascus – despite the career risks that they faced by deviating from the conventional wisdom on Assad’s guilt.